Former Arsenal shotstopper Wojciech Szczesny has given his opinion about his former teammates at the Emirates stadium. The Polish goalkeeper who spent eight seasons in North London before leaving for Italy, was speaking to YouTube channel, Foot Truck, when he was asked about his former teammates at Arsenal. 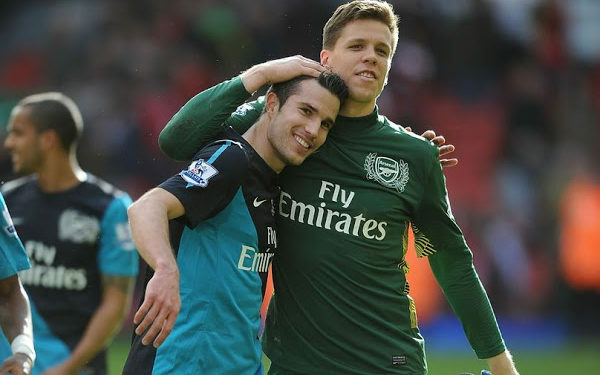 Szczesny described Robin van Persie as “extremely arrogant” and said the Dutchman could have gotten more out of his career had he stayed at Arsenal. “He could have made other decisions and achieved lots more at Arsenal,” Szczesny said. “He’s extremely arrogant – sometimes.” he added. “[I] have to admit, he left for Manchester United and the following year won a title. “[Nasri] always thought he was some kind of gangster,” he said about Nasri who left for Manchester City. “Everyone has this guy at school, who had strong and big friends and it made him think he was cool. The 28-year-old made a permanent move to Juventus in 2017 and won the treble in his first season.